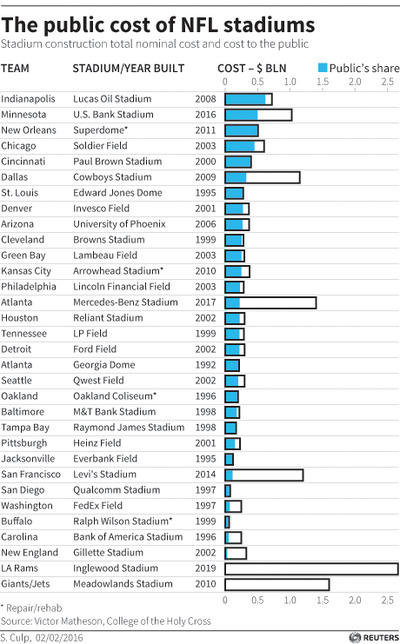 When it comes to paying for NFL stadiums, not city got stuck with a bigger bill than the citizens of Indianapolis and Indiana and the construction of Lucas Oil Stadium, which opened in 2008. Of the $720 million cost, the city and state were responsible for about $620 million. At the other end of the spectrum, the Rams’ new stadium in Inglewood and Meadowlands stadium, shared by the Jets and Giants, were both completely paid for with private funding. In this graphic, produced by Reuters, we can see how the cost of building or doing major renovations at NFL stadiums varies wildly. But, despite a handful of exceptions, the vast majority of the stadiums had the vast majority of their financing come from taxpayers.